« FEATURED on A Stroll Thru Life and One Year Blog-o-versary GIVEAWAY!!! This is so attractive, I love the green and blue, and the tray is fabulous! It is perfect with your wallpaper too, lovin it all! I am on a junk fast too – isn’t it hard? But I have finished several projects. I love the watery color of the top – just like a lake in the summer. The distressed green legs really add to the cottage look. Patti, this table turned out gorgeous! I love the color combination you used! It has so much charm and character!! It looks beautiful! I like the two-tone, with different color legs. The tray is really pretty too! Your walls are really nice too! I’ll have to get busy with some old furniture and try some chalk paint! It looks amazing! What an incredible job! Looks great Patti! Thanks for stopping by! This is totally fabulous! Love the color combo! So Pretty! Love this color combo. I love how you transformed this table. I wouldn’t have thought of green and blue together looking so nice. And I love how you made it look vintage–I agree that it looks very summer-cottage-beach-like. It’s a unique table style and your paint and accessories make it a wonderful addition to your home. It looks great and I love the color… although it makes me sad because I had a drop leaf table similar and I sold it. I love that color combination….you have given me such a great idea to combine those colors on a piece of furniture I have!! !…Great job….just beautiful! Your table turned out adorable, great job! Thanks so much for commenting on our blog, the Cottage is about 20 minutes for Portland, are you from there? Your newest followers. I love this table. What a great color. I love your vignette. I love drop leaf tables and yours came out so pretty. Love the shades of green and blue that you used. The tray is a wonderful accent piece. Thanks for the sweet comment you left on my blog about your coastal trip. I really enjoyed reading it. It’s so nice to connect with other bloggers from the Pacific NW! Stopping in from “Simple and Sweet Fridays” because I love your color choice. Looks like Annie Sloan Duck Egg Blue so it looks like a great alternative! Love the color choices that you did and that distressing is wonderful! Love the new look of the table, wheels or no wheels. I think she will sell quickly for you. Great find, and perfect color and paint technique for the beach. I’ll bet it’ll sell quickly. Lovely table but really love your walls! I love this color palette! Cute table! Just beautiful! Loving those colors. That tray you have on top is adorable ~ did you make that, too? I found you today at Sunday Scoop. I hope you get a chance to visit my blog, too. I’m co-hosting the DIY Showcase and would love for you to come by and link up! Patti, love the layering of colors. I think she will sell fast. 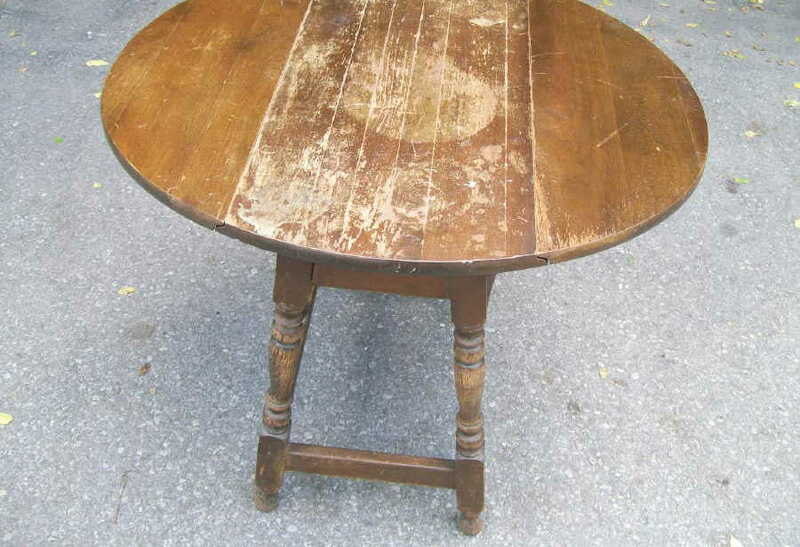 Drop leaf tables are wonderful! Thanks for sharing with SYC. Excellent look! The layered colors turned out perfect. Makes me sad that I let go of an old drop leaf table years ago. It could have been resurrected to be something interesting like this! Fabulous job Patti! I love the layering of the colour too… I just tried a little desk layering some colour, but I think I need to give the dark wax a try. Adds so much dimension! Wow, I love your color choice and your table-top decor is truly sweet! Great colors! Thank you for joining Home Sweet Home! I just love the way your table turned out! You did an outstanding job. What a great transformation! What a great score! This is just adorable, and I am definitely going to try your chalk paint recipe. Thanks for sharing on the BeBetsy BRAG ABOUT IT. Thanks for linking back to BeBetsy. Have a wonderful weekend! This little table is fabulous. I so have enjoyed finding your blog. Someone will purchase this little table and find warmth from it just being I their home. Simply fabulous….love how you took it and changed it so beautifully.